Playing all 36 games over the space of the month lets two things happen; there is a sole focus on red ball cricket for the majority of the season, and this is a great advantage to those players looking for a spot in the test team. Ben Cutting provided a prime example last Sunday that one day cricket still remains very exciting, smacking average Victorian bowling to all parts of North Sydney Oval. Granted, the access is very limited, but for those who went, they got value for money. Closely mirroring the format of the World Cup, it gives the players similar time constraints and preparation to that of the six week tournament. Has the experimentation worked? It is definitely too early to call. However, by devoting time to one form of the game will give players on the verge of being called up a good starting point to transition to the Shield competition, which will start in November. No side has to swap between formats, and four-day cricket is the ideal build up to the start of the test series. Bring the crowds in in the future and the tournament exposure becomes much larger once again. If you wanted a demoralising start, then the New South Wales Blues delivered exactly that – an 81 run demolition of the Tasmanian Tigers. After a first up loss to the top of the table Victorian Bushrangers, the Tigers have found their footing with two wins on the trot, both against the South Australia Redbacks, and both with one ball to spare. The Blues have taken the points in two of their three matches so far, the most recent against the Western Australia Warriors. Clinical against Tasmania in the first match, New South Wales came up against Victoria and an in-form Scott Boland. Ben Rohrer and Steven Smith just didn’t have enough firepower to reach a score that they could stop the Bushrangers from reaching. South Australia have been mighty unfortunate in their two close losses to Tasmania; both games saw Michael Klinger instrumental at the top of the order, with 140 not out and 74 across the two games. 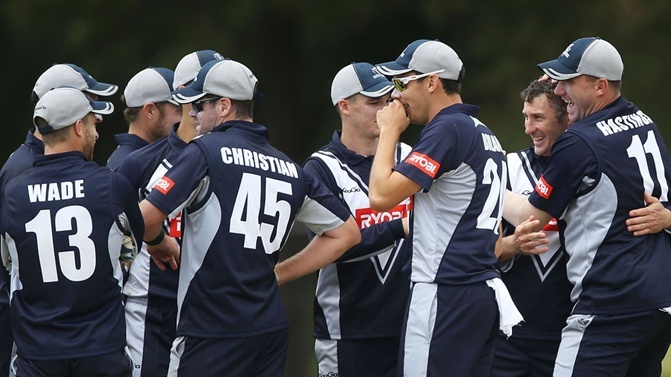 The Bushrangers, on the back of a Cameron White Blitz, were able to chase down the 232 South Australia set them in their first clash. Plenty of talent lies in the South Australia squad, but results simply have not gone their way. Recent triumphs in the short form will still have the Redbacks confident that they can grab four points. Top of the table Bushrangers have shown why they are the revered side in the domestic competition, the only game dropped against the Queensland Bulls. All-round depth is a key factor in allowing the Bushrangers to post both big scores and bowl well at the death. Cameron White has run into a rich vein of form and looks set to be the leading run scorer for the tournament. Queensland have taken one win from their two games so far, and Ben Cutting was a true stand out in their victory. Smashing 98 off 48 balls, including nine glorious sixes, delighted those watching at the ground or on TV. The Bulls are the current Sheffield Shield title holders and displayed just why they are so strong. When Ryan Harris returns and is able to prepare for the Australian squad, they will get even stronger. Western Australia are something of a mismatch. Injuries are plaguing the current side, meaning that young players are filling the gaps and leaving the batting and bowling line ups exposed. Missing opening batsman Liam Davis has asked the likes of Sam Whiteman and Cameron Bancroft to step up. Jason Behrendorff is developing nicely; but the support just isn’t coming, from a batting or bowling perspective. Win their last game and the top spot is all but assured for the Bushrangers; Queensland and Tasmania are hot on their heels after some emphatic wins.